It's not a new story. But these nineties working girls are real, fallible humans in a movie brimming with humour. The Associate builds to an hilarious, cathartic finale where hard work is rewarded and liars finish last. Why, an editor asked me, do we still have these movies about women not succeeding to the roles that their skills and ideas merit? Because women still live and work with the many gross and subtle indignities and put-downs, passed over, passed-by; and if they do succeed, their promotion is decried as yet another example of unfair discrimination -- just window dressing, not demonstrable superior achievement. Diane Wiest in The Associate Not that this is a unique problem. Maybe you don't fit in because you hate the opera, went to state schools, don't attend the right church, have the wrong racial mix -- the list is endless. Let's face it, the smallest group in the world is the privileged 'majority' of comfortably-born, well-educated, well-connected individuals whose life has been so easy that they cannot begin to conceive of any reason for not succeeding. And this while they stand tall on the shoulders of those they despise and disdain as lazy, incompetent and inappropriate. The Associate is a bit like television's Remington Steele -- female business consultant invents a male associate for credibility. In the workplace, high and low, testosterone is the grease that keeps the wheels turning. It would have been more like Working Girl without Whoopi Goldberg's input. Pointing out that as a secretary her character Laurel would not reasonably start a financial consultancy on her own, Whoopi suggested that a black, female Harvard graduate would be the perfect window dressing for a classy Wall Street firm. Frank: "Can you handle the truth?" Laurel: "Can you tell the truth?" She also wisely slapped down the strange male belief that women bond over a hot shop counter. 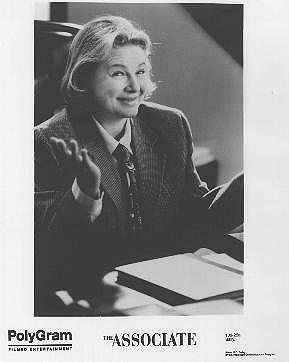 The last thing high-powered, suited Laurel wants to do is go shopping for a gift with her assistant's cardigan-wearing secretary Sally (Dianne Wiest). Laurel discounts the secretary as many of us write off people in support roles. But Sally is a treasure of untold talents, the woman who uses the secretary-network to get Laurel the key appointment, and goes on to prove herself an able manager. The Associate is filled with nice performances, Bebe Neuwirth, who was so wonderful in Cheers, is the stockbroker who believes success requires a good wardrobe of lingerie, Lanie Kazan plays a huge, demanding gossip columnist, and Tim Daly (Frank) is as believably slimy as the assistant who substitutes balls-and-bonding for brains as he was believably too-good-to-be-true brother in Wings. To be notified when our upcoming feature on Whoopi Goldberg is filed, click here.